Jio 1 month free recharge offer- one more surprise from JIO it provides free voucher to recharge for one month unlimited internet/ voice call etc., for selected customers. It also offers Grace Plan for one month for some of its customers. Check whether you are one of the lucky one who got it. 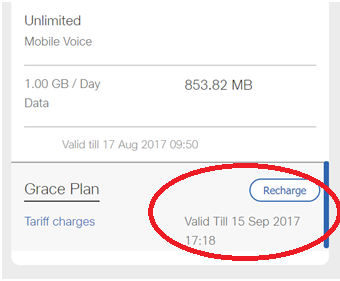 Jio is offering an another loot Recharge offer to their users. Now Get 1 Month Data + Calling Recharge for Free. Now you can avail to Jio 1 Months Recharge at Rs 0 for Free. This offer valid for Selected Users only. If you are using reliance Jio sim in your 4G handsets then you can’t afford to miss this offer. So hurry up & grab this loot offer now. Note : Offer Valid for Selected User Only. Those who haven’t recharged since 2-3 months are getting this offer. Click on Recharge & Active it. That’s it! Now Enjoy your 1 month free data. Note :- Offer Valid for Selected User Only.